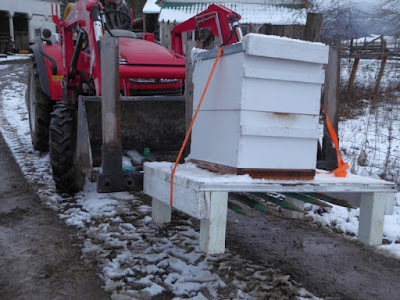 We finally got around to moving the beehive. 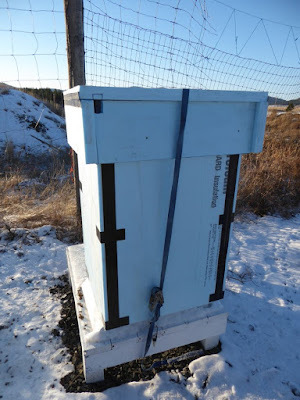 Those who have been following our beekeeping efforts might remember we lost our hive last year because we wrapped it up too tightly with insulating foam board. The condensation built up and killed our poor girls. 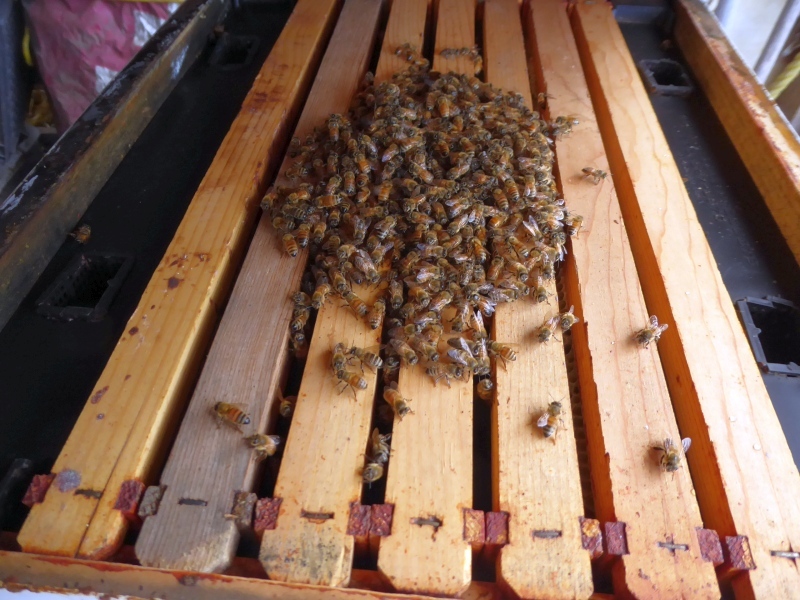 We started over with two nucs last spring. During the summer, the hives were savagely attacked by yellow jackets. But now winter is upon us. 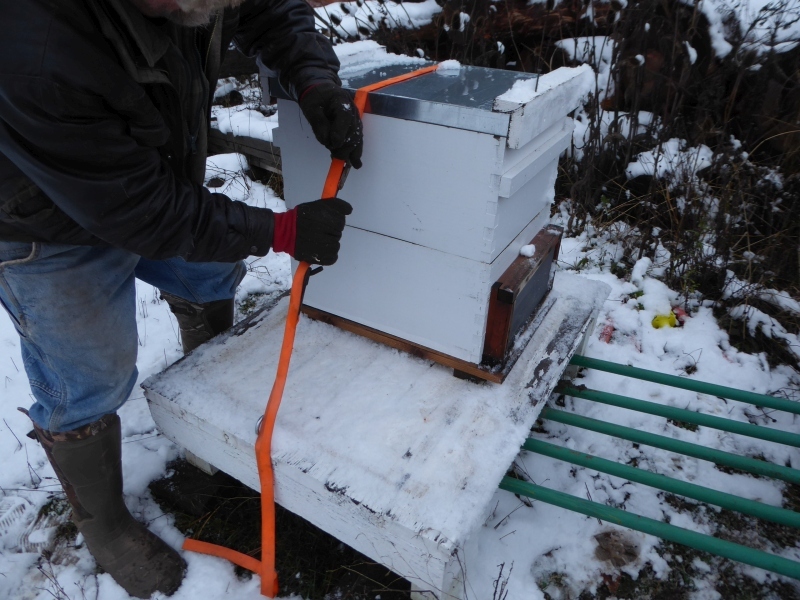 We needed to move the hive into a more sheltered location. 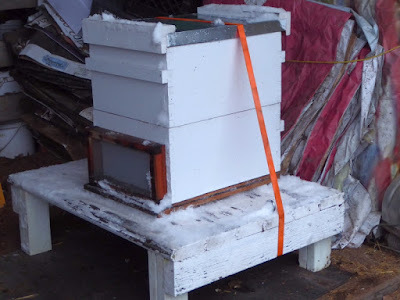 We're gun-shy about wrapping the hive with insulation after last winter's disaster, so we figured if we move the hive to a sheltered spot, the bees might make it. The reason he decided on bee candy is because we aren't confident the bees have sufficient honey to see them through the winter. Critical honey-making time was lost while fighting off the yellow jackets last summer, and even though we fed them syrup all summer long (and they had wildflowers as well), we wanted to give them a boost. The paste had to dry for a day. Meanwhile, we moved the bees. We took the precaution of plugging the opening to the wasp guard with a cotton ball, though it was unnecessary since the bees weren't budging from inside the hive. ...then used the tractor's forks to lift the hive. 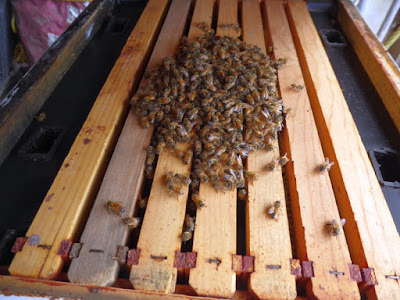 We settled the hive in one of the barn bays. Here it's protected from the prevailing wind. 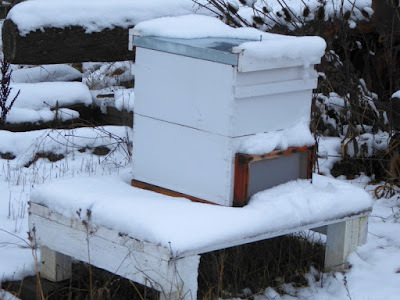 The next day, when the sugar paste was dry, we opened the hive top. Lots of bees on top, a (hopefully) good sign. 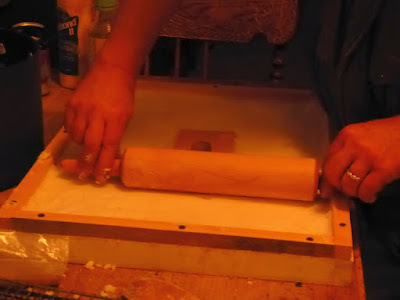 We settled the tray of sugar paste over the frames. 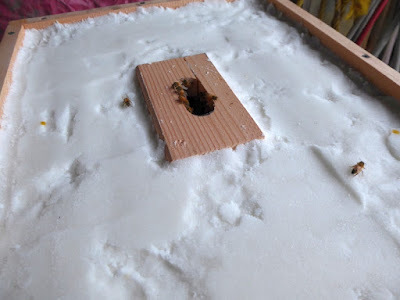 Right away, some of the bees started crawling through the hole onto the sugar. And that was that. We replaced the lid over the sugar tray, and left the bees alone to settle in. We'll be ordering more nucs for spring. 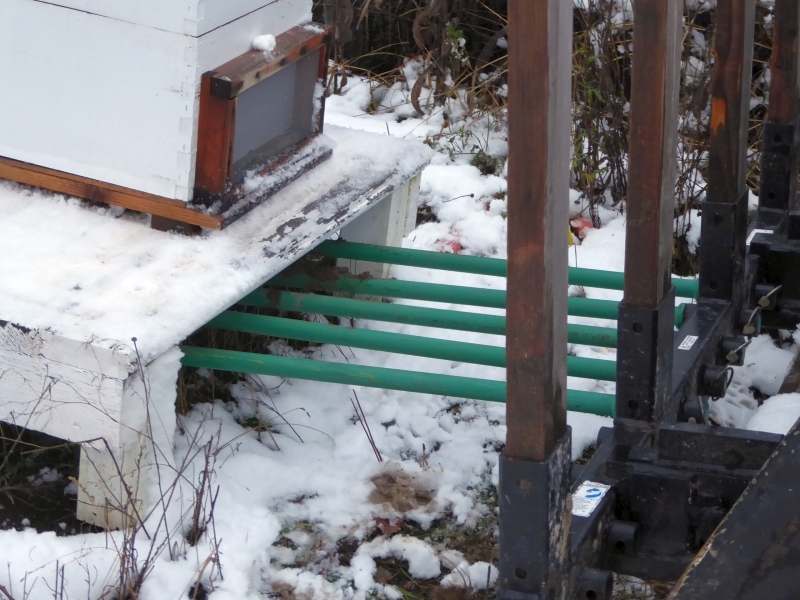 If, God willing, this hive makes it through the winter, that will give us three hives for next summer. If the hive doesn't make it, we'll have two fresh nucs. Live and learn. That's what I'm figuring out with bees: live and learn. 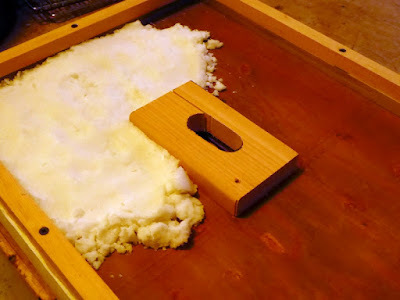 I pour a bag of granulated sugar in a top feeder in my hives for winter. Any excess moisture in the hives is absorbed by the sugar and creates the candy they can eat throughout the winter. I essentially kill two birds with one stone...food and moisture control. I don't insulate mine. But I do have it in a small fenced yard to keep it out of the wind. 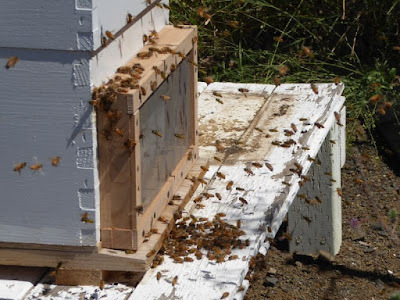 The hive is back against the north wall of the fence so that it can still get sun and warm up during the day. My understanding is that the bees still need to warm up and fly out to do their bathroom bizz bizz bizness now and then. Patrice, here's a question. 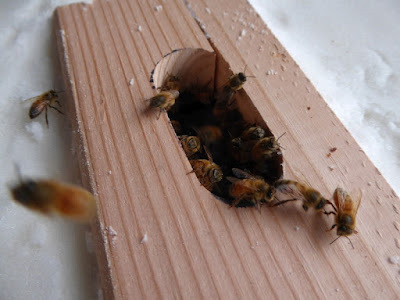 The bees sound like a project you keep sinking money/resources into (buying bee boxes, buying more bees, having to feed them year-round instead) without getting anything in return. Obviously you're hoping for a reliable honey source one day. But when homesteading or trying to set up a farm, at what point do you say the sunk costs are too high and quit pouring money or resources into something that isn't working? 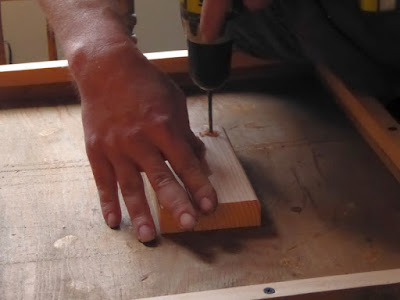 Have you had any big projects you've had to just give up on after trying everything? 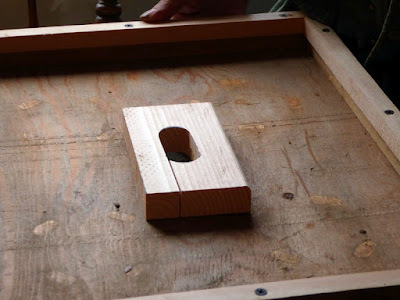 When do you make the call between something you think you need for self-sufficiency, and a project that's just draining you dry and costing you time/money that could be better spent on other projects? No snark. Genuine question. How do you find that balance? I have asked myself that very question. My answer is this. I know that start-up costs are there, and I'm willing to pay them, including time, money, and learning curve. Businesses do this. After a reasonable amount of time, (This is different for each project. Beekeepers will tell you that it takes three to four years before you get a harvest.) if the project doesn't pan out I am willing to stop. Since I'm not in it for the money, I just hope to break even after the initial phase. I also understand that setbacks will occur at times. That's my answer to your question. That's a good point, PG. I don't have bees, and I didn't know they put an end cap on the setup time, i.e. 3-4 years so you can estimate in advance some of the costs of getting the operation up and running. That does change things a bit. Thanks for replying. You're welcome. I also think about the cost of hobbies and entertainment. My critters are my hobbies and entertainment. There is another measurable value to keeping bees, even if you need to purchase new packages each spring. Our red raspberry, green bean, and blueberry yields all increased ten-fold the first year we had a beehive in our yard. 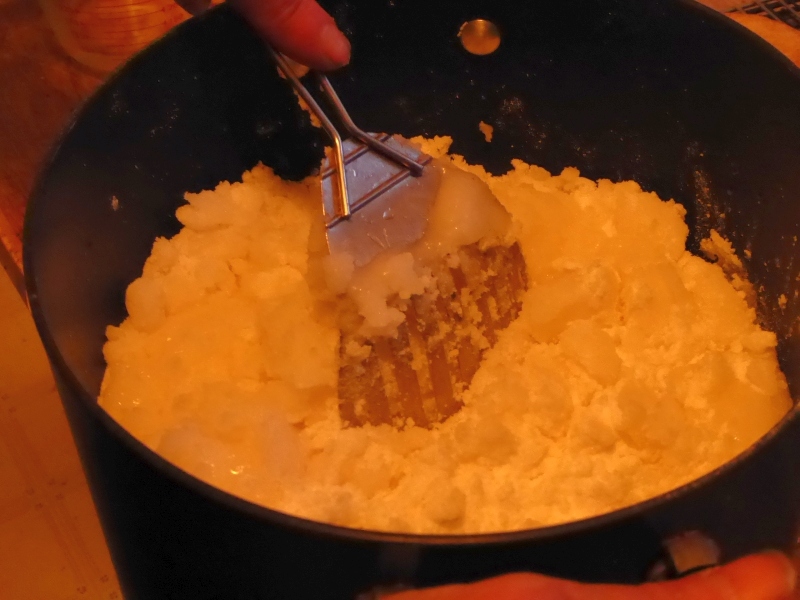 We went from having enough for a snack in all previous years to freezing and canning all of the extras post-hive. 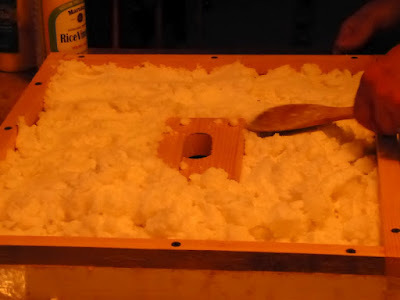 I'd say it was the second year when we started seeing some extra honey, about two quarts is my recollection... and our third year there featured around 3 gallons of extra honey. All beekeepers will tell you that they have good years (success overwintering them, lots of honey) and bad years (dead bees, little honey). We love our bees ! "Beekeeping? How hard can it be? The bees do all the work."... says the city boy to the country girl. I live in the Idaho Panhandle area and would like to know what flowers that grow well in my area are best for bees. I planted a little lavender, and a bunch of salvia. A flower called NY Aster is coming in spring. I had these in Spokane and they did really well and attracted many bees. Any others I should plant? I have 14 acres. 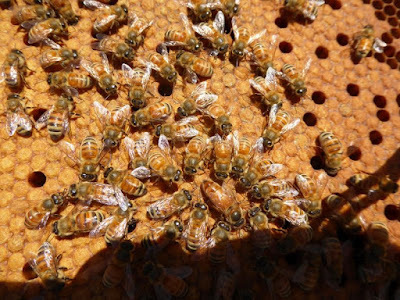 A couple of neighbors have just started bee keeping and I want to help out those little critters. Last summer we planted a northwest wildflower mix specifically geared toward bees. Of all the types that grew, one proved to be outstandingly attractive: Lacy phacelia. I'd never seen this type of flower before, but the bees absolutely loved it. Make sure whatever wildflowers you grow are native to the area. You don't want to introduce invasive species. A shameless plug for a group doing good things at Christmas. Angel Tree. Our daughter in law is in jail for drug related "crimes". I honestly don't know what she has done because when she entered her drug "hell" we never saw her. But she has three little children (the youngest was two when she left the home). Now in Jail and 'sober' she is back to her normal self and doing well. We are all looking forward to her release. But Angel Tree provides Christmas presents for the children of mothers (I think just mothers) who are incarcerated. We get the three grandchildren for two weeks at Christmas and one of their events will be a party that the women's prison holds for families. So those two things; the presents and the party with mom will go a long way to making their Christmas happy. Angel Tree volunteers just this minute dropped off the gifts and they are wrapped beautifully. As I understand it the individual in prison has to request this. So if you now anyone in this situation let them know. And if you are interested in helping you can find them on the web and they take donations. I work for MDOC as an Officer, Angel Tree is for both mothers or fathers that are incarcerated. Oh,forgot to mention, I don't use wax paper either, just a flat surface till hard and I also place small blocks in each of the back corners. 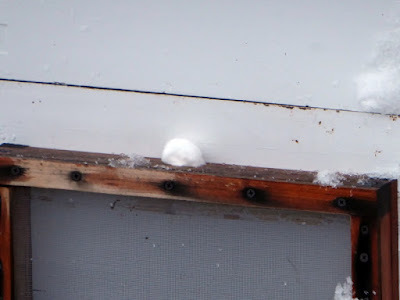 when blocks are removed it increases air flow. I also put 5 drops of organic lemon grass oil in the water and keep it stirred as I introduce it to the sugar. Lemon grass oil helps keep the bee's stress down.. Only wish to help, losing your girls gets costly and frustrating. Another tip, whatever candy is left over come spring just make into your 1st batch of sugar water, this is all part of what I was taught growing up on the farm. Good luck..
Huber Heights? I used to live there on a small hill. Everyday in the Summer we could see a thunder storm blow in usually in the afternoon. Beautiful Fall weather though. Then you know of the Fulton Farm between Troy and Huber.